Firefighters first assisted a lizard that was involved in a rollover collision in the Potomac area, then rescued another lizard from a house fire in Glenmont. 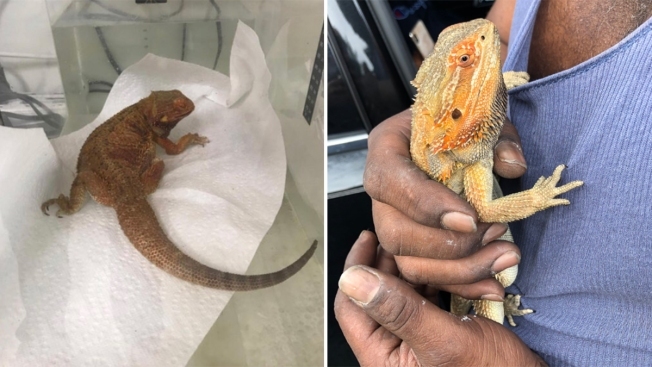 Montgomery County firefighters saved two bearded dragon lizards in the same day last week, after one was wounded in a car crash and another needed to be rescued from a townhouse fire. The dual lizard rescues happened Thursday. Firefighters first assisted a lizard that was involved in a rollover collision in the Potomac area. The driver was able to get out of the car safely. "But he happened to have a lizard in the car that got tussled around a little bit, was injured, was in fact bleeding," Montgomery County Fire & Rescue spokesman Pete Piringer said in a YouTube video. One of the medics who responded knew of an exotic animals vet nearby. "So they were able to pretty quickly get it down there and it got some care," Piringer said. The lizard is now recovering. Later on Thursday, though, firefighters were called to a two-alarm fire in Glenmont. "It was a pretty significant fire in a townhouse. But lo and behold, they had some pets involved there," Piringer said. Firefighters rescued another lizard. "Same variety, a bearded dragon," Piringer said. That lizard was exposed to some smoke but appeared to be fine. "At the end of the day, you just kind of shook your head a little bit," Piringer said. "It was a little bit unusual .... It was an interesting day for sure."